Surely customer experience is about building trust longer term, a more fulfilling value exchange, not just a series of sales transactions enabled by smart digital technologies. As digital and social become pervasive we will not need to talk about them as separate strategies, channels or new opportunities. In fact, we might be at that point now. While there may still be a lot of work to do to enable ‘digital’ for some organisations, perhaps that change is not so much about technology as it is about creating an environment for ‘real time insight and innovation’. That’s another topic.. 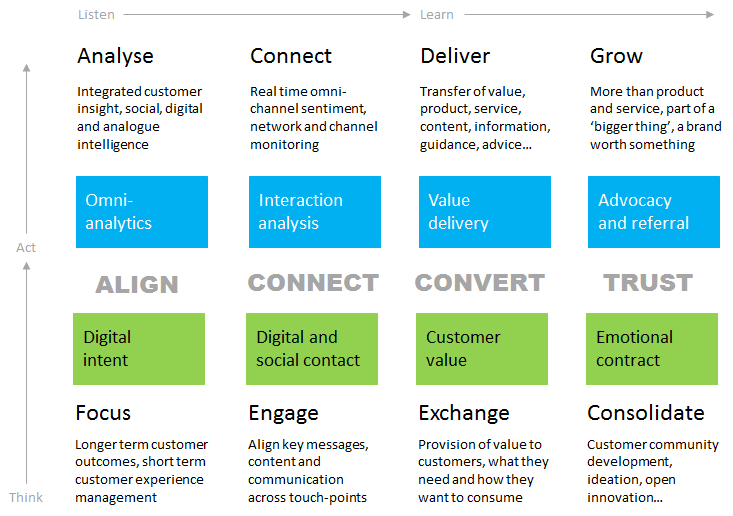 However, today, right now, digital and social have a pivotal role to play in delivering new customer value. New insight, intelligence, real-time marketing, persistent interaction, community building are just some prospects which can help align, connect. convert and ultimately build trust. But, only of any value if we have the right intent, shared purpose, shared value and clear focus on customers needs, fears and beliefs. What’s important is that we remain focused on customer outcomes, customer benefits and in that context how digital and social strategies can add value. The challenge is how to leverage digital and social to move from digital intent to an emotional contract with customers. We are seeing new opportunities to create trusted digital brands, not just sales opportunities, to add value to customers, not just service interactions more efficiently, to build trust as well as optimise returns. 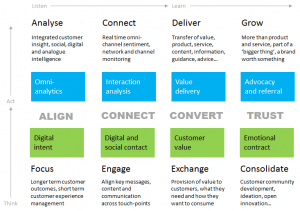 There are clear benefits for organisations that can adopt digital and social at scale. But, ‘the experience’ is primarily about delivering value to customers in exchange for fair commercial benefit. With that in mind we can’t go far wrong.